Japanese podcasts are a great way to fit extra listening practice into your day, and if you have access to transcripts, they can be a great way to practice reading too. With that in mind, here are a list of podcasts that are great for studying. One of the best podcasts for beginners is the Learn Japanese Pod. There are plenty of episodes covering all sorts of topics, giving you plenty of material to study. Each episode comes with the script in Japanese, and a translated transcript so you know exactly what is being said. The hosts switch between English and Japanese regularly which is great for beginners who might be overwhelmed with an all Japanese language podcast, and for those who might not be able to access the scripts. What really sets this podcast apart is the quality. Not only are the voices crisp, clear and easily understood, but every example sentence is carefully thought out and repeated multiple times. The hosts do a good job of making it accessible for everyone. A lot of the podcast episodes are free, but signing up on their website gives you access to more material. If you want absolutely everything the site offers, you will need to pay for a membership. NHK has produced a great series of podcasts for beginners. 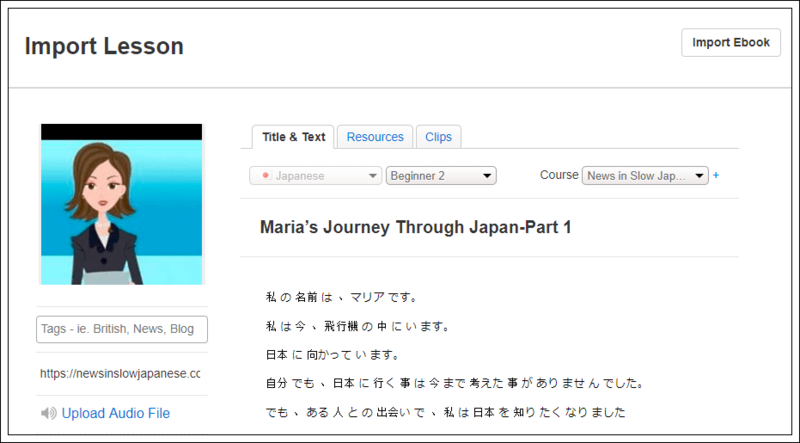 The series follows the story of Anna, a fictional character who comes to Japan to study Japanese. The premise is a relatable way to introduce some of the most common phrases and grammar points in Japanese, and the level is great for absolute beginners. The lessons not only provide translations and examples, they also provide context for why characters say and do certain things. For example, when to use more formal です and ます endings as opposed to more informal る endings, among other cultural aspects of the language. Explanations are provided in English but there are no written transcripts for the conversations. If you want to study further there is an entire website of material to review once you have completed the episodes. Each comes with helpful clarification for basic grammar, along with vocabulary lists and more. Unfortunately, the series recently came to an end. Despite this, the easy to follow conversations and story make this a great podcast to start with, even if you never look at any of the extra material. If you can overlook the lack of transcripts, this is an amazing resource if you are just starting out. One of the issues with podcasts is a lack of quality content. This is particularly true of language learning podcasts, where a large variety of topics is vital for keeping interest. This is where News in Slow Japanese really shines, with episodes dating back to 2013, covering an enormous range of issues. The show follows general trends, but focuses on more interesting aspects of culture, instead of the bleak day-to-day news you see on TV and in newspapers. Each audio file comes with a fast and slow version, which helps bridge that awkward gap between beginner and intermediate. One excellent addition to the transcripts is the addition of a mouseover dictionary feature. If you are using a PC, you can hover over a word you do not understand, and a translation of the entire sentence will appear. It’s a small feature, but it is incredibly useful. The biggest downside is that a lot of the content is for premium members only. This includes a lot of the podcasts, and any study materials to go with them. The lack of variety in the voices might put some people off (the website is run by one woman) but if you do not mind her voice, it should not be a problem. Although the ‘fast,’ version is closer to native speed, it is still not quite at a native speaker’s pace. If you are coming to the site as a beginner or lower intermediate learner this should not be a problem, but more advanced listeners might want something that is more challenging. Another great intermediate podcast is Bilingual News. This podcast comes with its own app that allows access to translations, but most of these are only accessible if you pay. Where the ‘News in Slow Japanese,’ follows a rigid, formal register, ‘Bilingual News,’ is far more informal. Both participants chat about the news in unscripted conversation, meaning it is perfect for intermediate listeners looking for more authentic conversation. The unscripted nature means that episode quality varies, but every episode is completely authentic. One of the major quirks of this series is the half Japanese half English conversation format. One person speaks only English, the other only Japanese. I can imagine this being an absolutely brilliant format for people learning both English and Japanese, but native English speakers will have to decide whether this podcast is for them. Podcasts can be a great way to improve your listening skills, but sometimes listening is not enough. If you want to get more out of your studying, rather than just listen, you should also be reading. That’s where the transcripts and LingQ come in handy. Let me show you how using News in Slow Japanese. First, copy the transcript and import them into LingQ. You can find the import button at the top right of your page. Paste in your transcript and upload the audio. You can also add pictures and edit clips to help you take advantage of LingQ’s sentence mode feature. Afterwards, save your lesson and begin studying. Listen, read, and save your new vocabulary for review. If you want to improve your Japanese faster, than this is the way to go. Don’t forget, you can also use it on mobile and take it on the go. LingQ not only allows you to import Japanese podcasts, but you can import anime, YouTube videos, music, and more. Check out LingQ for free and start learning Japanese online. Sam De Roeck is a native English speaker living in Japan. He should probably study Japanese more, but he spends all his time watching horror movies instead.